Even though everyone says they don't, they do it. They try to look perfect in pictures. Right now you know all those everyones are gathering their families together and posing their kids in front of the Christmas tree for the perfect picture. THE Christmas card picture that will show the world how cute, fantastic and beautiful and amazing their family is. And while I'm sure those families are indeed cute, fantastic, beautiful and amazing, I am also sure they are not perfect. Not perfect is what my family does really well. Even though I know this and embrace this, I still try for that perfect shot. And I fail miserably. But every year, our family picture tells a story. A real story. A story that is messy, loud, full of wrestling and bickering and laughing. A story of a family that is cute, fantastic, beautiful, amazing and totally, completely not perfect. It was bold to think that my husband and I could get in the picture and it would work out well. Bold and wrong. This shot is as close to "perfect" as we might get. It tells the story of mismatched PJ's and socks. Wade having to be restrained by big brother Peyton. Lucy working her smile and JT seconds away from doing a crazy dance. These pictures make me smile and make me love my kids more. I'm so glad I got all these so far from perfect pictures. Sure, I might like the shots better if they were all in matching PJ's, but someday down the road I might remember that I was waaaay too tired to coordinate that. It's all a part of the our story. I hope more people send out the real pictures of their families. Not only will I feel better about my unruly brood, I will also feel like I'm getting to truly know their stories. Here's a great article from Babble on how to take better (not perfect, but better) pictures, click here . 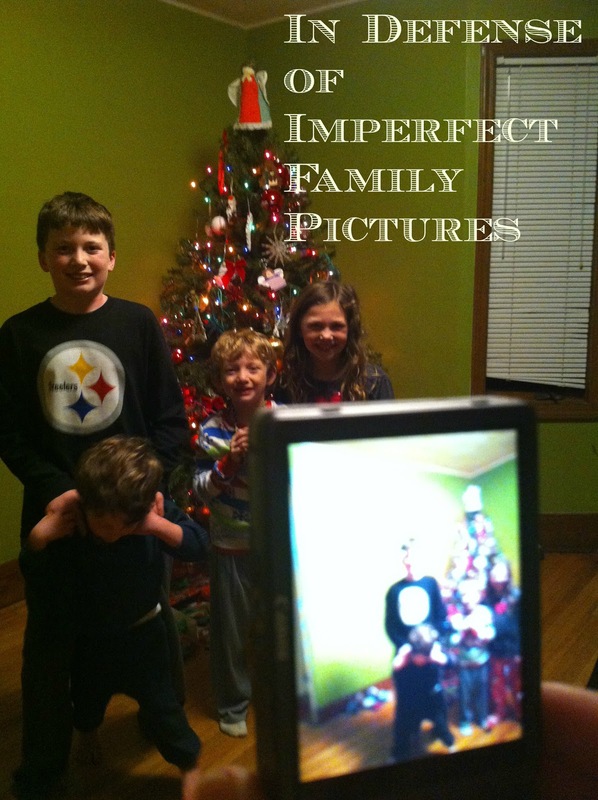 It's not just pictures that we do imperfectly. 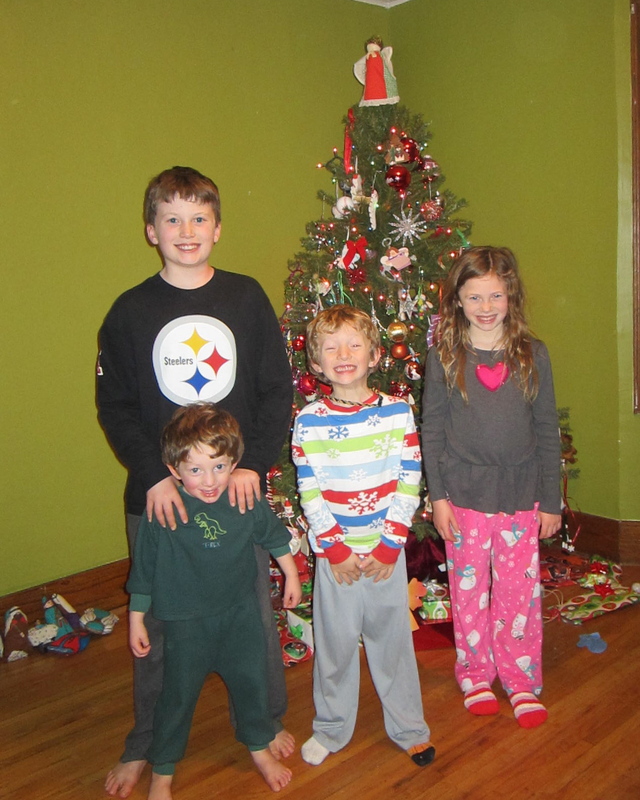 Check out this short video on how we decorate for Christmas. This is so yesterday, but I was one of those nerds that thought recognizing 12/12/12 was fun. After school, I had the kids write down 12 things that make them happy. It was a fun after school project that didn't take long. Barbies still make Lucy happy, which makes me happy. Peyton included YouTube on his list which is funny. JT wrote down Keith Baboo, our makeshift elf on the shelf, which I love. Then it was my turn. It was fun. Rarely do I think about what I like. Do you? Try it. List 12 things right now, do it, have fun. Love that idea. Glad you get me. Hope you are having a very, merry Christmastime. OH these are all so very perfect. I see the makings of a little Christmas book of sorts... they tell the very sweetest of stories.